Today, they’re having an evening meeting with Christophe Castaner (pictured), Minister of the Interior. The police union Alliance is calling on members to stay in their stations tomorrow, effectively closing police stations for the day, and only respond to emergencies. Rolling news is interviewing police representatives and showing anonymous police complaining of extreme fatigue and pressure as well as poor pay and working conditions, such as working 14 hours straight and not being able to eat or drink. The 2019 national police budget will see a drop of 62 million euros according to RT France. This excellent Gefira piece from June of this year, High suicide rate under the French police as the state is under permanent attack, contains a map of France showing where police have been attacked, and briefly profiles some of the cases of surprising violence directed against them. It is known that the banlieues, some of the rougher areas in France, now contain higher percentages of illegal migrants, and the violence there seems to be morphing into something new and proportionately more dangerous. Police don’t seem to be getting the support they need to deal with this. 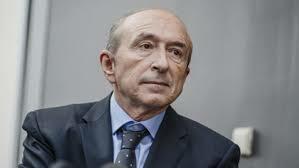 Above all, Collomb’s departure takes place amid persistent and broad-based protests and complaints among the police and domestic security forces. So the Yellow Vests are just the straw on the camel’s back in terms of police work pressure. But the new protest movement is something the police themselves have shown sympathy for (see image), and gives them a ready-made context in which to take their own action. 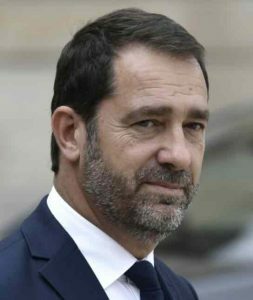 And just in the last 24 hours, Castaner has been moving in police – in the dark – to selectively tear down the Yellow Vest encampments around ‘rond-points’ or traffic roundabouts, which have acquired a symbolic value for the protestors as places where they come together and unify in solidarity. This is likely to be an inflammatory move. The privatization of France is not taking place without a fight. The protests began in France four weeks ago against the government’s planned fuel tax hikes and got off to a mainly peaceful start. But since then they have grown increasingly violent and the list of grievances and gripes against President Emmanuel Macron and his government have ballooned. While the anger and hatred of protesters is directed at the president, it is being taken out on the country’s police forces. For the last three Saturdays, they have come under a hail of cobblestones and bottles, had fireworks aimed at them and at times simply been given the run around by rioters and looters. Although their response to violence has not always been exemplary, as some videos on social media can attest to, the French police say they are tired of being the punchbag for Macron and his government. While the police “risk their lives” at work, Alternative Police states that unpaid overtime and underpaid night shifts have left them suffering the same poor living conditions as the yellow vests they confront at the weekends. If their demands are not met, they warn the consequences could be serious. “Since November, police have been permanently mobilized for the different gatherings and demonstrations of yellow vests which have share of violence, looting. The Yellow Vests movement has also hit London. If not handled “properly,” this will be the fall of Theresa May at least, and in the long term, the EU itself.